While perusing around through Pinterest, Instagram, and Teacher's Pay Teacher's something keeps repeatedly catching my interest. I'm not just talking about Essie nailpolish or the latest Teks (although those are adorable, I must say!). 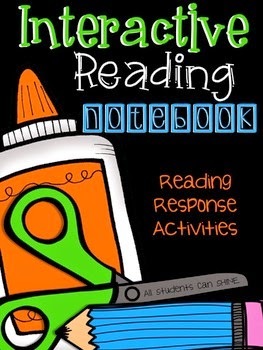 I'm intrigued by interactive reading notebooks. I'd love to give them a try but I'm really stuck on how to make it work, what it would look like, and how to manage it. Right now, I am using the Daily 5 model with guided reading groups in my classroom for my reading instruction. My school will be shifting to a balanced literacy approach this fall. So I ask myself.....am I taking on too much to try to use both the interactive notebooks and the balanced literacy model simultaneously? They are both new to me. I love how interactive notebooks encourage students to dive deeper into texts and to look for key details. I like how the notebooks offer another way for students to show their understanding of story elements, comprehension skills, and story sequence. I have had this resource by All Students Can Shine on my wish list on TPT for a while. As I continue to see more and more examples of interactive reading notebooks I am left with some questions. How long do I allocate for a page to be completed? Currently, students are working in 10-15 minute rotations using the Daily 5 model as I meet with reading groups. Is this enough time to read a text and complete the selected response? Are students able to complete the tasks independently, for the most part? Would this replace the "word work" or " writing" components of Daily 5? Do I purchase the notebooks or have parents provide them? At what point in the school year would I introduce them? And lastly, are interactive reading notebooks appropriate for first graders or are they better suited for higher grade levels?